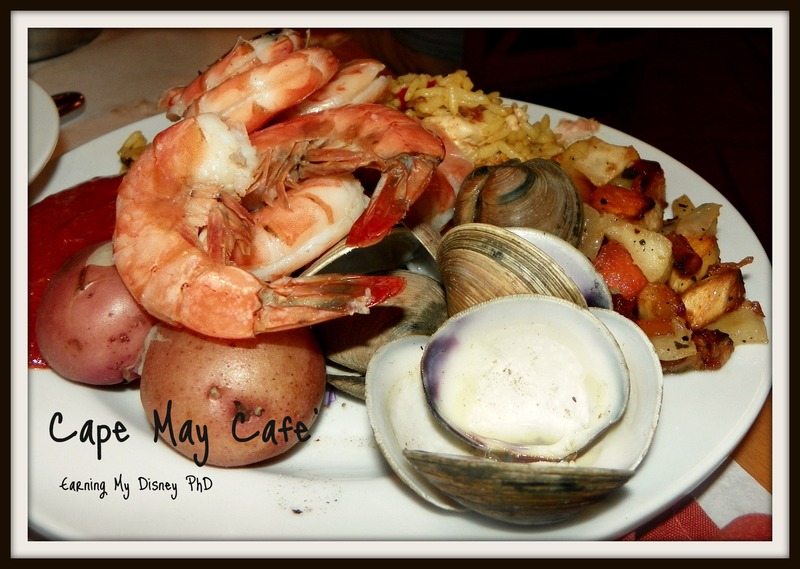 Cape May Cafe – Seafood Buffet – Dinner Day 2 – What's for Dinner Moms? Plate from lower left (clockwise): red potatoes, peel-and-eat shrimp, paella, roasted root vegetables, and clams. We arrived for our reservation 15 minutes early at the Beach Club. We sat in the lobby for only about 5 minutes before our buzzer went off and we were seated for dinner. We had a later reservation of 8:00 pm so the restaurant was busy but not overly crazy. Our waitress showed up shortly after we were seated to take our drink orders and when we returned from our first trip to the buffet our drinks were at our seats. This is one of my gluten-free son’s most favorite restaurants because there is very little he cannot eat. There are a few items on the kids buffet and salad bar but overall most other items are gluten-free. They did offer to make him a separate piece of salmon if he wished but he found enough other items that he really liked so declined the chef’s offer. 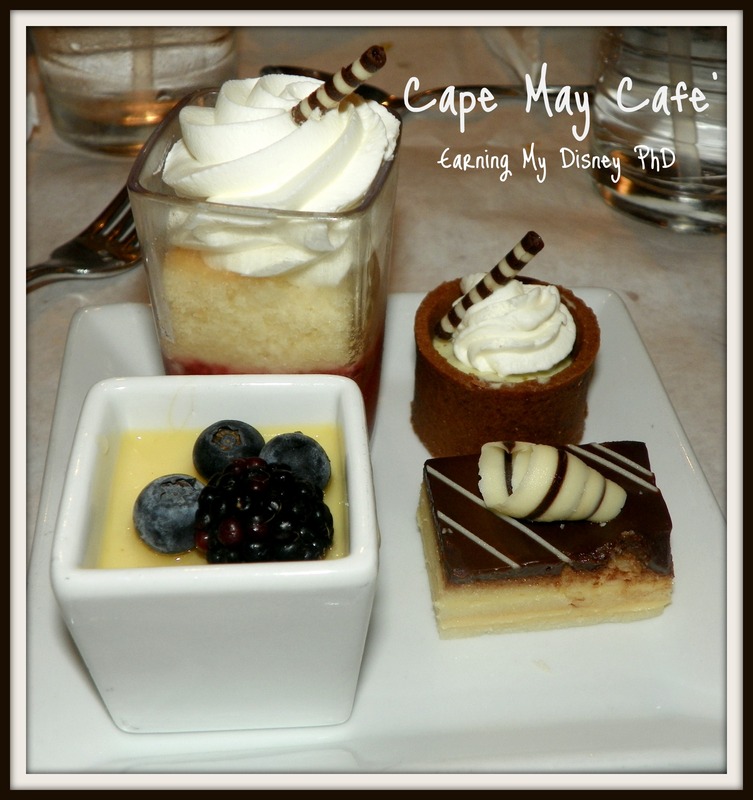 For those that love seafood Cape May Cafe’s Seafood Buffet can be a little slice of heaven. Shrimp, mussels, clams, fish and crab legs are all available. But, are there other dishes for non-seafood lovers? Of course there are! 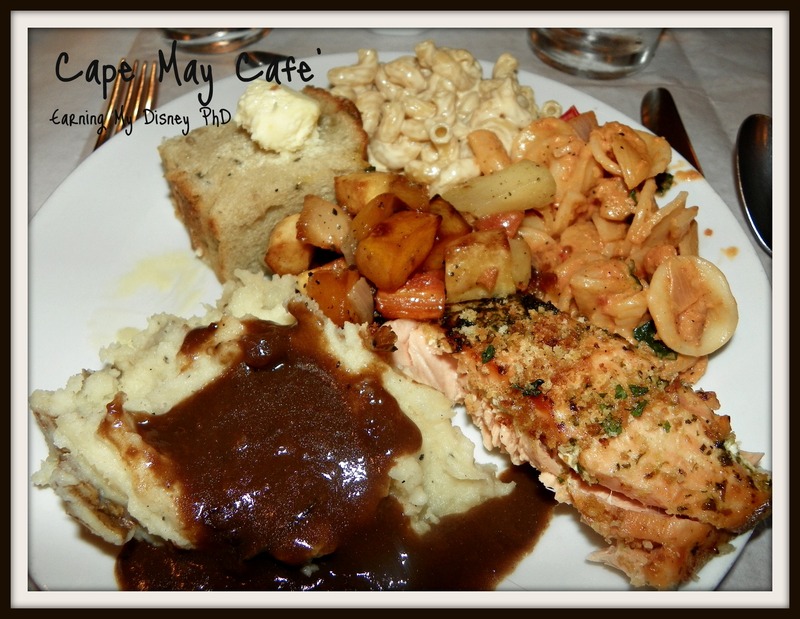 Roasted Chicken, Macaroni and Cheese, Barbecue Ribs, Chicken Nuggets, Pizza, Salads, Corn on the Cob, Rolls, Corn Bread, Mashed Potatoes and at least one pasta dish and sliced meat are offered most nights. The beef was a bit overdone for my taste but it was still very good. 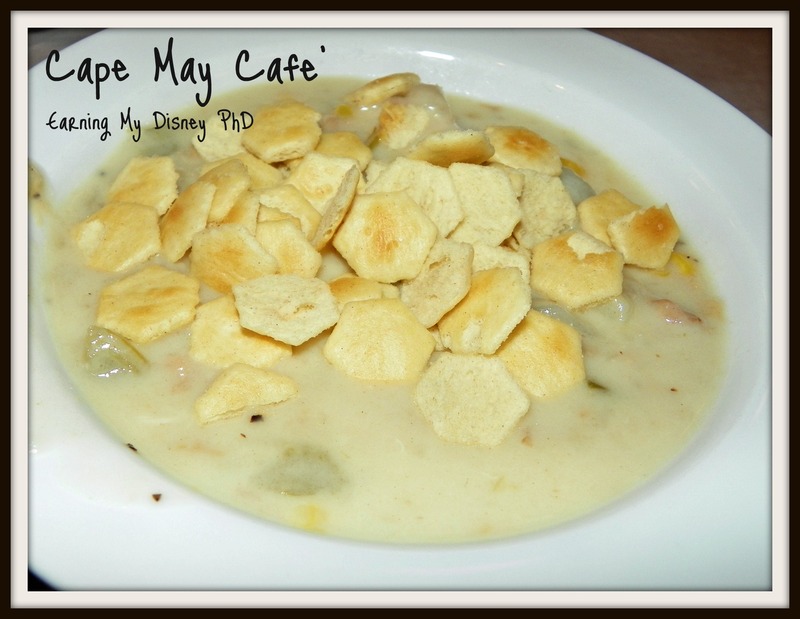 My favorite dish of all through is the New England Clam Chowder. This is the main reason I love eating dinner here. I know it is just Clam Chowder but I love it. 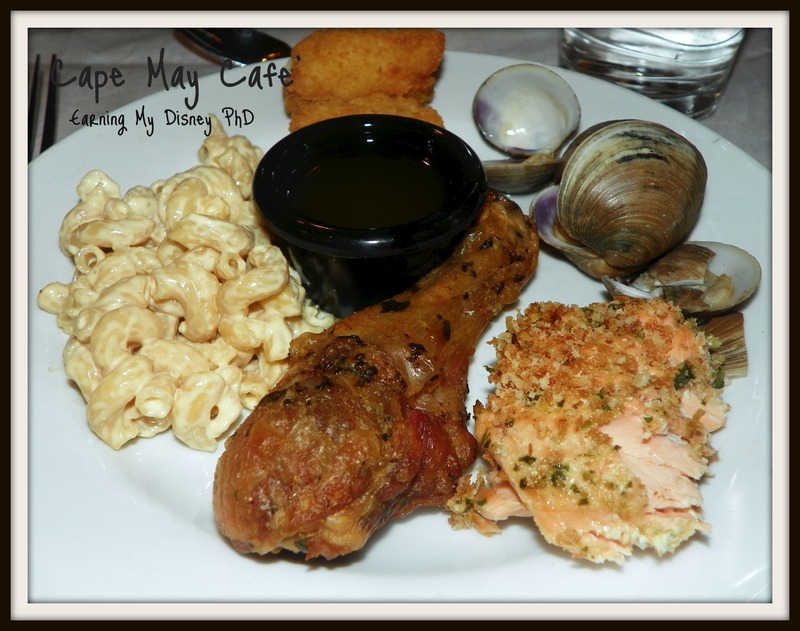 This is the reason the rest of my family loves Cape May Cafe’. 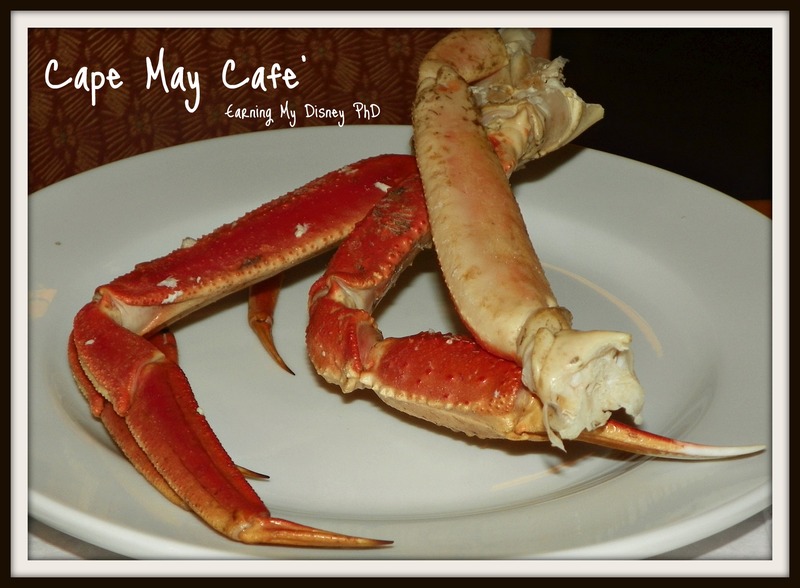 Several plates of crab legs were eaten by my family. I like crab meat but the work needed to get such tiny pieces of meat out is just not worth the effort to me. They loved them but I will stick to the salmon, and clam chowder. My two favorite dishes of the night (other than the New England Clam Chowder) were the salmon and the roasted root vegetables. The salmon was delicate and not overly “fishy” tasting. While the roasted root vegetables were sweet and surprisingly not bitter at all. I usually associate parsnips, squashes, etc. with being a bit bitter but these were perfectly cooked and seasoned. This was a celebration for a 50th birthday. The kids loved that they kept calling their Mama a half century old. It was a cute little celebration dessert. We tried one of every dessert offered that evening except the cookies and cupcakes which are the standard cookies and cupcakes served at all the restaurants. The favorite desserts of our party were the chocolate eclair bites and the cheesecake cups. 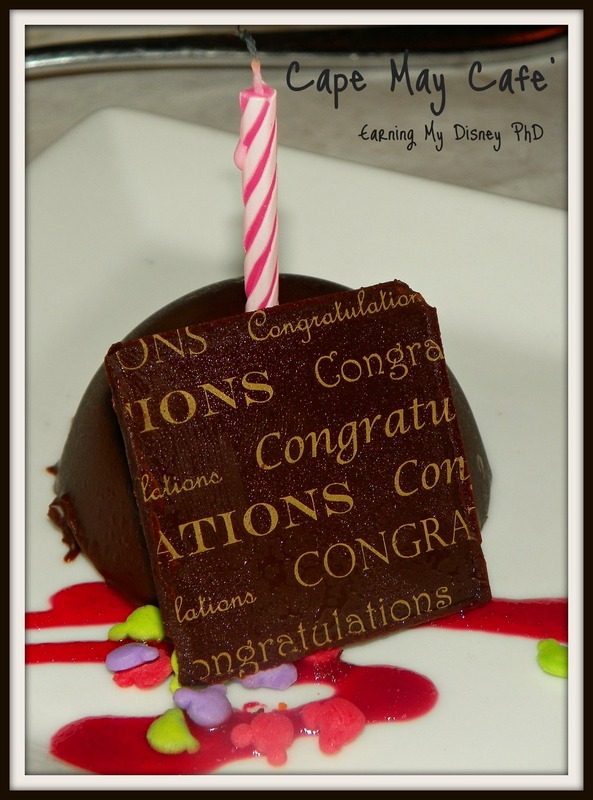 *Transferred from Earning My Disney PhD. Originally published May 24, 2014. 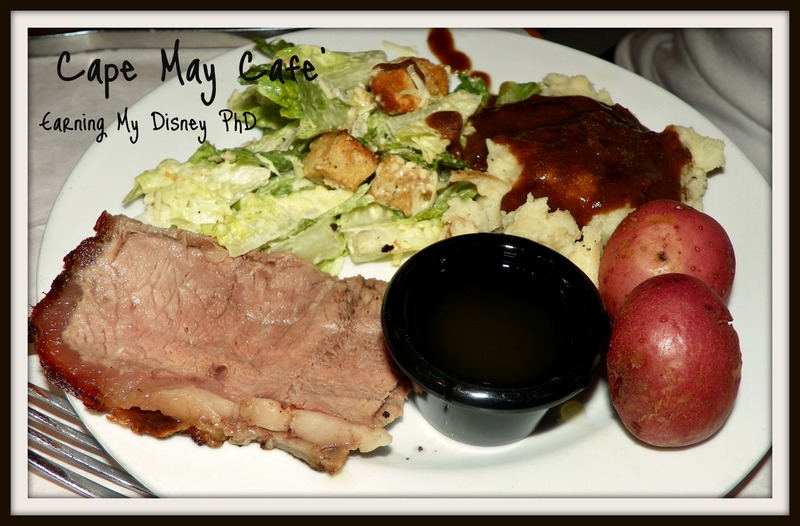 Next Post What Is There do do for the Youngest Visitors at Walt Disney World? All of that looks SO.GOOD!! My sister lives in PA and has vacationed in Cape May before. Last summer we went to Ocean City, MD. Are you from that area? No. I used to vacation as a college student in Wildwood, NJ every summer. It is one of my most favorite vacation memories. 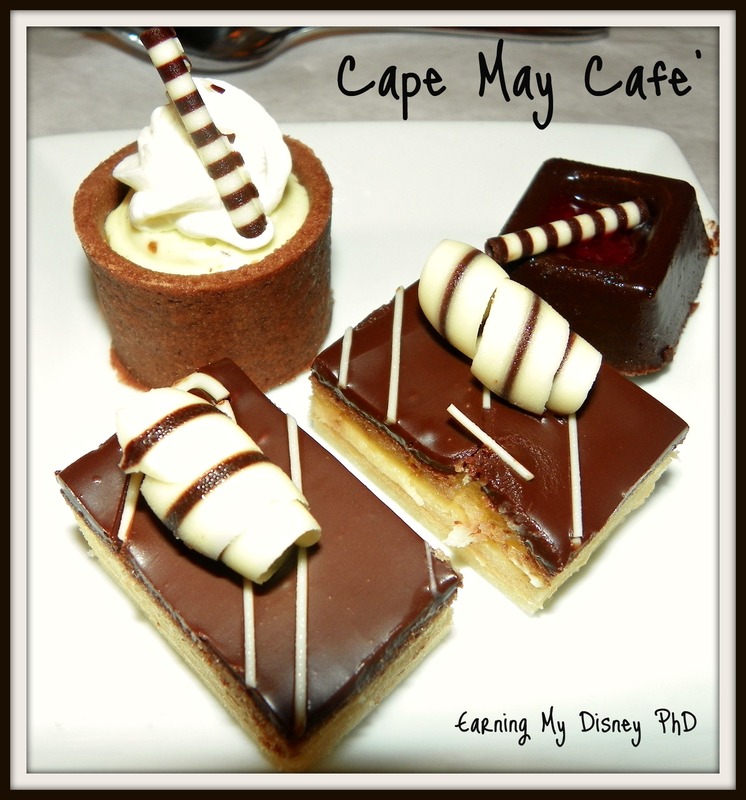 This is actually Cape ay Cafe in Walt Disney World. OHHHHH LOL!! Good ol’ Wildwood!! I have to admit the food looks pretty good!